Gulfstream G650 Nears Speed of Sound | AVIATION WEEK » OPShots.net - Cyberhub to Cleveland Aviation and the World! Gulfstream’s new G650 has exceeded .99 Mach during certification flight testing, the company said today, helping pave the way to its goal of being the world’s fastest civilian aircraft. There are four G650s involved in flight trials now, with a fifth to join the test fleet soon. One of those “exceeded point 99 Mach by a fraction” during scheduled tests last week, company spokesman Jeff Miller told Aviation Week this morning. 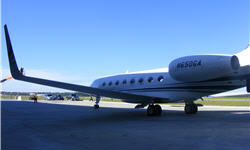 via Gulfstream G650 Nears Speed of Sound | AVIATION WEEK.